A good time to get on the long and winding road to trading CBOT Corn Market for profit is today so reserve your corn trading system now. We suggest you also watch for weekly or monthly chart price reversals in the corn commodity futures market as a long-range trading trend indicator. Keep in mind, monthly corn charts are usually more powerful vs weekly corn charts as a long-range trend indicator when trading corn and the grain markets and commodities. A weekly or monthly "reversal down" and a sell signal is when this weeks/months high price is higher than last weeks/months highest price but Friday's or the month's-end close is below the close from the previous week or month. A weekly or monthly "reversal up" and a buy signal is when this weeks/months lowest price is lower vs last weeks/months lowest price but Friday's or months-end close is higher than the close from the previous week or month. The mission of CornTradingSystem.com is to provide a Corn Trading System to all commodity futures traders who are paid members of our new (coming soon) Corn Trading System Club. By becoming a paid traders club member you will receive a Certificate of Investment to The New Corn Trading System Club. By using your monthly fee club investment number you will be sent your Corn trading system in the mail, supplied on a CD. Trade commodity grain futures markets using your Corn-trading-system for as long as desired. Corn, (also known as Maize in most nations of the world who grow corn outside of the USA and North America) is a widely traded commodity futures market which is traded by traders, hedgers, investors and commodity price speculators as a tradable commodity. It's referred to as a corn futures contract. Corn futures contracts are traded on the Chicago Board of Trade (CBOT) under the ticker symbol "C" with corn futures deliveries yearly in March, May, July, September and December, with the July and December corn contracts traded on the CBOT being the most important delivery months in our opinion. Corn is being used increasingly more for heating using special corn stoves (similar to wood stoves) which are available for heating via corn/maize or by wood pellets to generate substantial heat. Corn cobs are also used as a biomass fuel source. Feed corn is low priced so home-heating furnaces are in use which use corn kernels as fuel, featuring a large hopper to feed the normal size corn-kernels (or wood pellets or even cherry pits) into the fire. Corn is increasingly used as a feedstock for the production of ethanol gasoline fuel by combining ethanol with gasoline in order to decrease the amount of pollutants emitted by using 100% gasoline which of course comes from crude oil when used as motor vehicle fuel. High gas prices recently led to greater demand for ethanol, which in turn caused higher prices for corn farmers. This led to a recent years corn harvest resulting in sky-high corn prices and one of the most profitable corn crops in history for grain and corn farmers. Because of the relationship between fuel and corn, prices paid for the crop it's widely believed corn futures prices tend to track the crude oil and gasoline commodity market prices to a degree. It has been erroneously asserted that recent food price increases were mainly the result of higher prices for corn and a tightening of corn supplies. Transportation costs including shipping expenses involving imports and exports, and trucking domestically, are a large percentage of the price of corn and corn-based foods, and higher fuel prices for transportation effect store food prices. Corn prices on the CBOT futures market sometimes will diverge from the price of cash market corn if commodity futures traders and investors believe actual corn supplies vs corn demand are skewed in a different direction vs. what's indicated by corn market fundamentals and corn crop conditions, including the weather. Farm-based maize or corn more and more in demand as a widely used feed-stock for bio gas and ethanol production plants, where after harvest corn is shredded then placed in silage storage from which it's fed into the bio gas plants. Biomass gasification power plants are also being constructed. 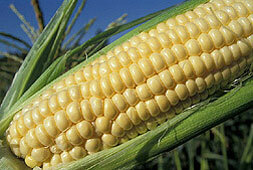 Research is also underway to make diesel fuel out of the often corn-based bio gas by the Fischer Tropsch method. The Fischer Tropsch bio-fuel conversion system for making diesel fuel for diesel engine performance uses a mixture of carbon monoxide and hydrogen being converted into liquid hydrocarbons. The most common catalysts are based on iron and cobalt. The primary intention of this process is commercial production of a synthetic petroleum substitute, usually via coal, natural gas or biomass, for use as synthetic lubricating oils or as synthetic fuel which fuel can be used (more cleanly vs organic fuels) in automobiles, buses, trucks and some aircraft engines too. Increasingly ethanol from corn is being used at low concentrations (10% to 15%, or less) as an additive in gasoline (known as gasohol or bio fuel) for motor vehicle fuels to increase octane ratings, lower pollutants and reduce crude oil use. You may want to later try a different grains trading system simply login to your club membership area, enter your unique club membership number and one more Corn trading system will be sent to you. There is no limit to how many times you can do this (beyond the number of trading systems we have available at any given time).